007 must thwart Blofeld's plan to use biological warfare to threaten the world. In the process, he meets Tracy di Vicenzo, a countess whose courage and charismatic spirit earns her the name Mrs. James Bond. Lisbon, Portugal; Murren, near Interlaken, Switzerland; St Moritz, Switzerland; College Of Arms and MI6, London, England, UK. Q makes his first appearance in a teaser sequence, when M comments that they need to find 007. An Aston Martin speeds along a seaside road and is passed by a woman in a red sport scar. Later, the driver spots the woman (Tracy) walking into the sea. James Bond jumps into action and saves her from drowning herself, only to find himself in a fight with goons on the beach. Tracy steals Bond's car and drives off. 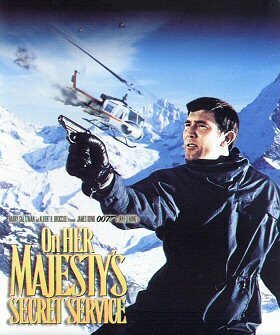 There is no direct use of the title in the film, although "Her Majesty's Secret Service" is mentioned on a few occasions. Bond: "This never happened to the other fellow." When Tracy and Bond are on the beach, and Tracy drives off, you can hear the tyres screech - not something usually associated with wheels on sand. 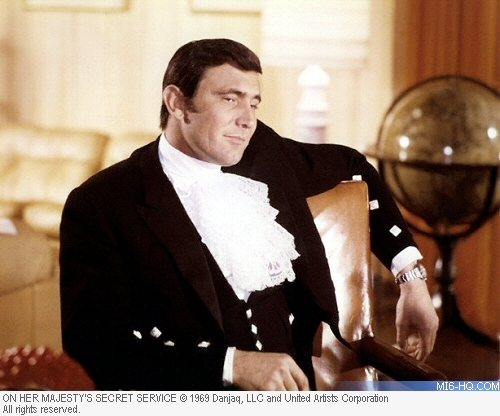 Lazenby's one and only appearance as Bond - he turned down a seven-picture deal. Most European non-English language prints and videos are cut and omit the scene where Bond is almost caught in the office of Blofeld's lawyer cracking a safe. The scene is now being included in the German TV version. Some versions include a scene where Bond's blonde colleague (the mountain climber who also appears before the office of Blofeld's lawyer in the above scene) tries to check out the valley station of the cableway to Piz Gloria, and gets thrown out by Blofeld's guards, who speak in an unsynchronised Swiss German dialect. This scene is apparently missing from either the German and English versions. The original version edited for American Television was re-cut in several places. The film started "in medias res" with the escape from Piz Gloria, then flashing back to the beginning of the film. The entire film featured Bond's voice over (done by a different actor than Lazenby), and included a shot before the wedding in which Bond and Tracy buy her the wedding ring and Irma Bunt's reflection is seen in the window of the jeweler's. See the Release History page for full details on the extensive cuts and differing versions of the film. "James Bond Will Return in Diamonds Are Forever"